Lambing in Jeffries Front Flat has now finished. It is certainly not a normal season at Bonavaree. Having had the total annual rainfall in only 8 months (200 mm since lambing started) has delayed a few things. 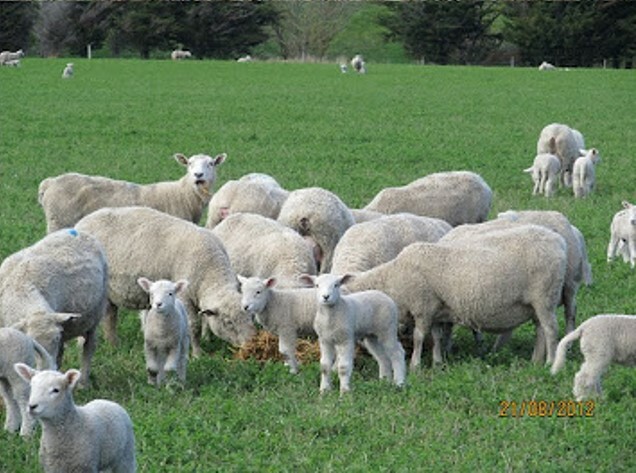 The lightly set stocked ewes on this paddock, and many others, would usually be mobbed up into larger mobs by now, and then rotationally grazed. The mobbing process has only just started on some of the earlier lambed ewes. Tailing is now underway, but would usually be near finished in a typical year, but with the mud and water that’s around then best practice is set aside, and the feeding of animals comes first. Doug’s preference for this paddock would have been to put twice as many sheep on than is stocked now, and graze it quickly. The worry being that spring growth is being delayed by extended grazing. However, the system needs to be flexible, and you need to respond to what is currently happening. Therefore light mob stocking and keeping the animals on longer on this paddock has been necessary in the “unbelievably wet conditions”. Growing lambs at 400 g/day is the yardstick at Bonavaree, and to do this ewes must be fed well! When we were out there, there were several lambs grazing the lucerne, which contributes to the lamb weight gains that Doug and Fraser achieve. 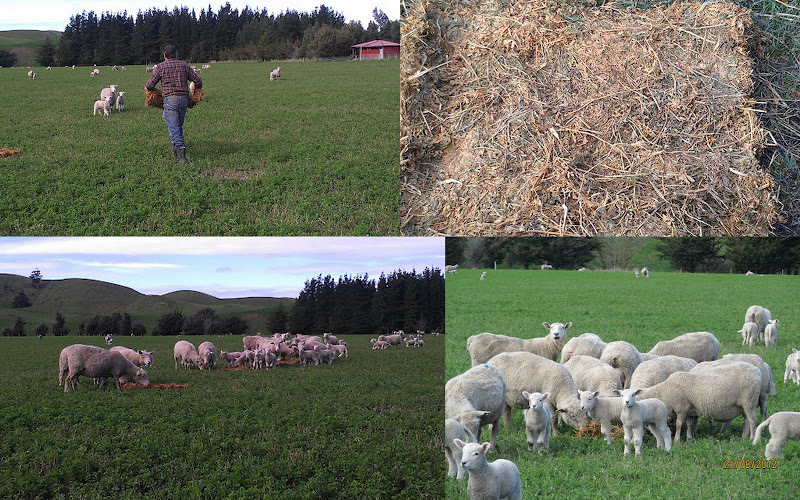 The sheep in Jeffries Front Flat, and other pure lucerne paddocks, receive good quality lucerne hay. Doug and Fraser have made small bale parks at each lucerne paddock to enable easy feeding out at this time of year. With the lightly set stocked ewes being in small mobs it is easy to throw the slabs out into the paddock by hand, and minimises disturbance of lambing ewes. The hay is fed out every couple of days. 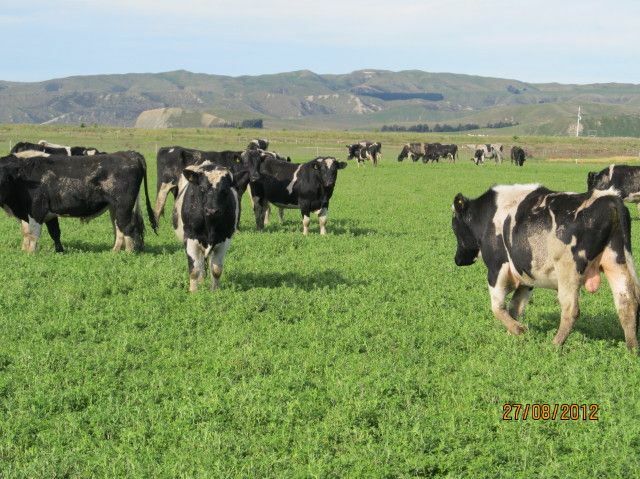 It is used to introduce some fibre to the straight legume ration, to balance out the lush growth of the lucerne. It didn’t take long before the ewes brought their lambs over once the slabs of hay were taken out. It is an indication that it is a requirement of their selected diet, since the amount of feed available is certainly not limiting. It is a waiting game at the moment. Once the sunshine hours increase, soil temperatures improve, and then the feed situation at Bonavaree will change very quickly. That is why the use of cattle finishing on these paddocks is so important – to realise excellent weight gains in the cattle, but also control the rapidly increasing feed bank, and keep quality at the optimum. Bloat capsules are essential! 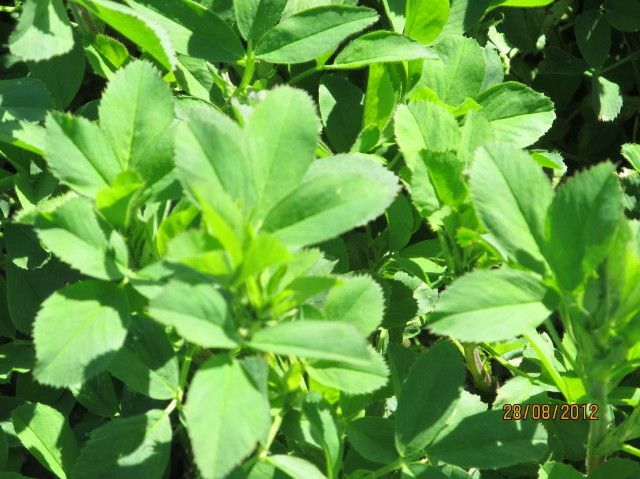 Lucerne is an upright growing plant with a large leaf (picture above) that is capable of capturing large amounts of sunlight, which it converts to energy through photosynthesis. So when the sun starts to shine a bit more things will really start to move!